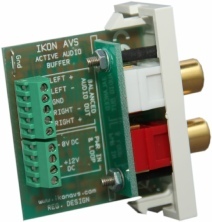 25mm module utilising the AB-25™ board, active audio buffer with dual phono inputs and balanced line outputs. The unit requires an external 12V power supply. Dual screw terminals are provided for power allowing the looping of a single power supply to multiple buffers.